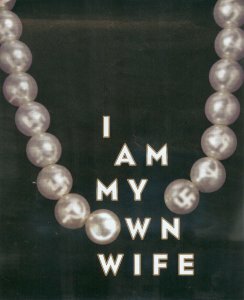 Jefferson Mays has been playing Charlotte von Mahlsdorf, the transvestite hero of I AM MY OWN WIFE by Doug Wright, for five years (including workshops and Sundance labs)--and it shows. Mays, who won a 2004 Tony for his solo performance, magically brings to life not only Charlotte but 35 other characters, changing voice, posture and personality in a twinkling. Charlotte, a quirky, defiant but flawed woman survived in East Germany under homophobic Nazi and Communist regimes, despite her openly gay life. Luck and compromise were involved; in Act I she escapes imprisonment when the Allies topple Hitler; in Act II she saves her neck by becoming a Stasi informer. Although Wright doesn't try to whitewash her shortcomings, he skims over the fact that she betrayed her best friend.